Mark Trumbo had career highs with 34 home runs and 100 RBIs in 2013 but hit a career-low .234. PHOENIX — The Arizona Diamondbacks acquired the power bat they sought in outfielder Mark Trumbo on Tuesday, sending pitcher Tyler Skaggs to the Los Angeles Angels and outfielder Adam Eaton to the Chicago White Sox in a three-team deal. The D-backs also are to receive a prospect apiece from the Angels and the White Sox, and the Angels get left-handed pitcher Hector Santiago from Chicago. The trade was an off-shoot of conversations between Arizona’s Kevin Towers and White Sox GM Rick Hahn about left-hander Chris Sale, whom Chicago will not move, and comes just 11 months after the D-backs dealt away Justin Upton in an effort to make their offense less long-ball dependent. Trumbo is expected to slot into the No. 4 spot in the order behind Paul Goldschmidt, and his presence gives the D-backs a 1-2 punch that projects as one of the best in the National League. Goldschmidt had a career-high 36 home runs last season, and Trumbo has averaged 31.7 in his three full seasons with the Angels as a first baseman/outfielder/DH. He will play left field for the D-backs. "We came to these meetings looking for pitching and looking for power," Towers said. "We tried to add offense, and we’ve got a guy that we can control now for three years. Two of the probably better right-handed power bats in the National League. Excited to see how it all works." One scout familiar with both teams believes Trumbo will fit well in Chase Field. His guess on Trumbo’s homer/RBI totals: "35 bombs (homers) and how many guys are on base when he hits those HRs." Goldschmidt and Trumbo are two of the seven major leaguers who had 30 doubles, 30 homers and 100 RBI in 2013. Pedro Alvarez and Jay Bruce were the only others who played in the NL. "I’m a huge fan of Paul. I think this lineup is gong to do some real damage, and I’m glad to be a part of it," Trumbo said in a conference call. "The biggest transition (to the NL) is to learn the new arms. I’ll be doing some homework." "It doesn’t come without some pain. 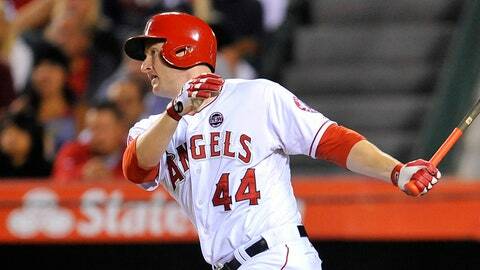 We will miss Mark Trumbo," Angels general manager Jerry Dipoto said. Towers made it clear as the 2013 season wound down that he wanted to inject more power into a lineup that hit 130 homers, 11th in the National League in a hitter-friendly park. No one but Goldschmidt had more than 14. The D-backs were fifth in runs scored, but they want to get more in bunches. The 2013 spring plan was to use Eaton as a leadoff hitter, but he missed three months with an elbow injury suffered in spring training, and the D-backs were a different team when he returned. Big thanks to the @Dbacks for giving me such a great opportunity the last 3 years, best of luck moving forward. Amazing amazing fans and the organization for giving me the opportunity and to my teammates thank you for the great times! The sum total of the Upton/Trumbo deals for Arizona is this: The D-backs dealt away Upton, Chris Johnson, Skaggs and Eaton and added Trumbo, Martin Prado, Randall Delgado, Zeke Spruill and four minor league prospects. Trumbo hit 29, 32 and 34 homers in his three full seasons with the Angels, with a career high 100 RBI last year. His batting average (.234) and OPS (.747) were career lows in 2013, but he had a career-high 281 total bases. He finished second in the AL Rookie of the Year voting in 2011, when he hit .254 with 29 homers and 87 RBI.